8th November 2018 beloved husband of the late Nancy, (formerly of Lincoln Courts) loving father of Lynn and Rhonda and much loved grandfather of Andrew, David, Ron and Stuart and great grandfather of Emily, Mollie, Leon and Jude. Family flowers only please. 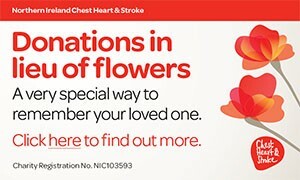 Donations in lieu of flowers if wished to the Heart Chest & Stroke Association, North West Office, Springtown Industrial Estate, Ballinska Road, Londonderry, BT48 0LY. I am sorry to tell you that Roy CAMPBELL has passed away.